Last week Toyota announced its revised 2019 TRD Pro lineup which basically puts better suspensions on the venerable Tacoma, Tundra and 4Runner. 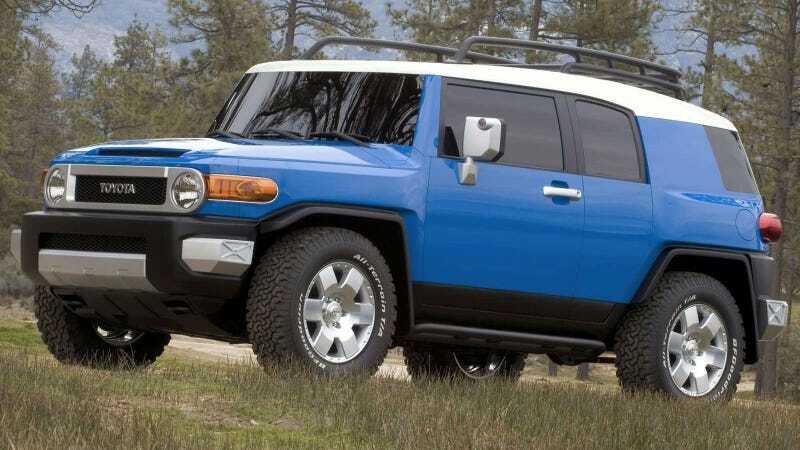 All three will come in a color we haven’t seen since the FJ Cruiser, and the 4Runner gets one more carryover from Toyota’s beloved but abandoned Wrangler rival. Check out the roof rack! Obviously, the 2019 4Runner TRD Pro’s top-mounted basket isn’t the exact same unit used on the FJ Cruiser, which was sold in the U.S. from 2006 to 2014. But it looks pretty much exactly the same. I seem to remember the pudgy pseudo-retro off-roader’s demise being blamed on slow sales, but the last FJ had a damn good run. Eight years without a major revision is an epically long time for any car model to last, but used ones have held their values quite well. Anyway, in a note that’s been sort of lost in the hype over “new 2.5-inch Fox shocks” is the fact that the new TRD Pro lineup will be sold in Voodoo Blue, famously optional on the FJ. We might not be getting a bonafide successor to that vehicle, but I guess we can call this new upgraded off-road oriented 4Runner its spiritual successor. Today’s 4Runner TRD Pro can be had in “Cavalry Blue”, which is a nice and conservative silvery blue hue. But Voodoo Blue is one of the best blues that’s ever been sprayed and I’m honestly thrilled it’s back. It’s fun and distinctive but stays shy of obnoxious. I think you could safely buy a Toyota in this color without feeling self conscious, which is kind of the sweet spot for a good car color isn’t it? The 4Runner is one of my favorite SUVs and I’m dangerously close to favoring it even over the mighty Wrangler, but we’ll talk more about that when I’ve spent a little more time with both. For now, I’m just excited that Toyota is giving us exactly what I want: the same old SUV with sweet suspension and a little flavor in the color palette.